iKP (i-Key-Protocol, i = 1,2,3) is a family of payment protocols and one of the ancestors of SET. We have analyzed iKP on the property that if an acquirer authorizes a payment, then both the buyer and seller concerned always agree on it. We have found that even 2KP/3KP do not possess the property and then proposed a possible modification of 2KP/3KP. We have verified that the modified 2KP/3KP possess the property. We mainly describe the verification in this paper. 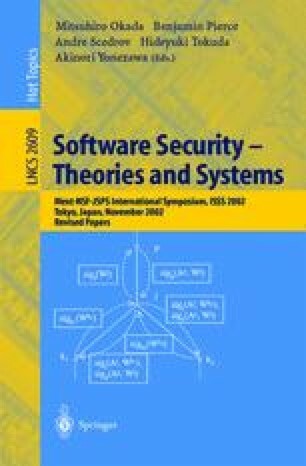 Bellare, M., Garay, J.A., Hauser, R., Herzberg, A., Krawczyk, H., Steiner, M., Tsudik, G., Waidner, M.: iKP-a family of secure electronic payment protocols. In: First USENIX Workshop on Electronic Commerce (1995) 89–106 (http://www.usenix.org/publications/library/proceedings/ec95).